Sarah Brown alongside (from left) Chris Dalliston, Dean of Peterborough, and Donald Allister, Bishop of Peterborough. Sarah Brown has been installed as the new Canon Missioner of Peterborough Cathedral. 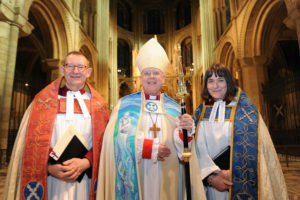 The ordination took place at an Evensong service at the Cathedral on Sunday afternoon (21st January). Despite the snowy conditions, the Cathedral was filled with worshippers and well-wishers – including some who had come in minibuses from Sarah’s previous parish of Daventry. Among those taking part in the service was Chris Dalliston, who himself had been installed as the Dean of the Cathedral on the previous day. Sarah’s role as Canon Missioner will be to promote the Christian faith to those who visit the Cathedral or attend as worshippers, and to provide an important link between the Cathedral and the wider Peterborough Diocese. She will also be an important member of the Chapter (the legislature of the Cathedral). Prior to her appointment, Sarah was Team Vicar of Daventry with Special Responsibility for Braunston, Welton and Ashby St Ledgers and Rural Dean of Daventry. She has been an ordained parish priest in the Daventry area for the past ten years, and has also worked in the ministry training team at the Diocesan Office in Northampton. She was also the head of the Farm Crisis Network (now the Farming Community Network or FCN) – a Christian charity which supports the farming community. During his sermon, Bishop Donald Allister thanked the people of Daventry for “the gift of Sarah”. He also said that the Cathedral “is the same as any other church – a particular focus in the city and a particular focus in the diocese’, and that Sarah’s role will be ‘to make sure the Cathedral is thoroughly missional and outward-looking”. I was tremendously touched that people took the trouble to come to the service – people showed spectacular commitment. I hope I can bring some of my parish experience to bear on Cathedral life, and help to create a thriving link between the cathedral and not only the city, but also the wider diocese. I want to take the Cathedral to the parish, and the parish to the Cathedral.